The Style & Casting Inventory Setup allows user to set up item categories, item and location. These setups are used to record transactions in the Style & Casting Inventory module like receipts, transfers, issue, physical inventory etc. Item category helps to set items of similar nature under one head. Item category can be defined as ring, bracelets etc. From this screen user can create an item and add basic information about it such as category, cost, purchase/sell unit, vendor id etc. This feature helps user to add location ids and description. Receipt is used to record all the purchases that user makes from various vendors and all the sales returns. Receipt transaction enables to capture several details while receiving items. Issue is used to record all the sales that user makes to various customers and all the purchase returns to vendors. There are several details that can be stored in the window for issue of items. An item issue transaction can be generated for the items Returned to the vendor as the purchase return, Sold to customer and for opening balances. This issue can be used to issue diamond set, metal and style to production departments or workbag if the production module is not started. User creates a Transfer to transfer stock of one or more item to some other item or from one location of business to another location. In such transaction stock is transferred from one location to another without affecting total inventory. Transfer option is also used, if adjustment includes both receipt and issue. This feature helps user to generate and print barcode tags for style / item (s). When a WIP bag is closed (if company has WIP option) or a completed style is lying at inventory which is ready to ship, but is needed again to be brought to WIP stage or needs to check again, in such case it is possible to make stage transfer from this screen only. 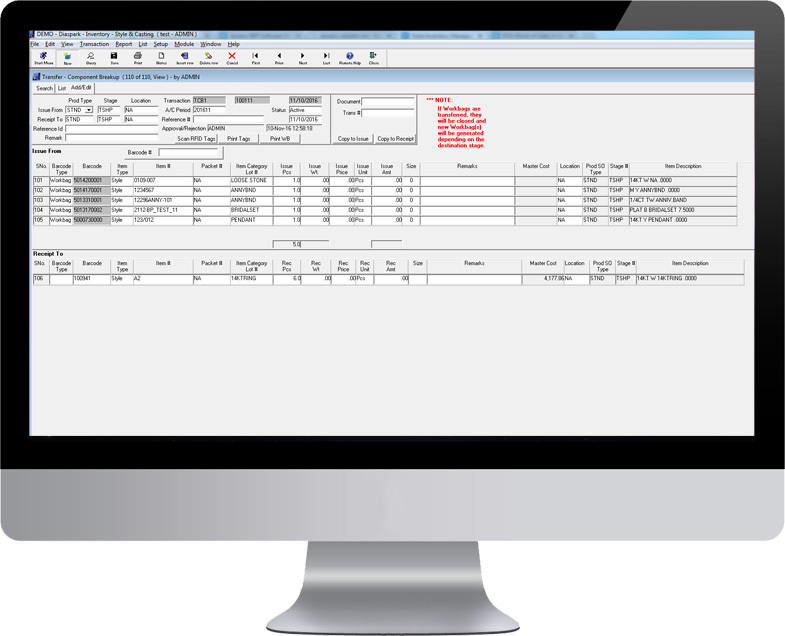 This option provides user with the facility to enter, adjust and post physical inventory data. Posting of inventory transactions can be done on monthly basis with this screen. This report gives all the details of receipt transactions recorded. It shows item id, number of pieces received and their amount. Issue report gives user a list of all the issue transactions recorded through Issue option. It shows details of items issued such as item id, number of pieces, unit, their price and amount. With the help of this report user can have detailed information for transfer transactions done. This report shows all the activities of items in regard to stock, memo, receipts, issue and in-hand quantity. This is very important report to watch any discrepancy in the stock with physical inventory. This report is helpful in getting stock details along with the purchase memo, sales memo and in hand stock details in a specified time period. The report shows backdated report e.g. if user wants to know the stock report as of Jan 1, 2007 then he can use this report to view backdated report. With the help of this report user can get the current status of the stock. User can also define the criteria for getting the details of any particular item. This report gives user a summarized view of a style / items in regard to its opening balance, purchases, sales, transfer and closing balance. With the help of this report user can valuate current stock with different methods. The report is needed to submit in banks on month end/ half yearly or yearly. With the help of this report user can know excess or shortage quantity of an item. It will provide with the details of quantity produced and excess / shortage quantity of item. This helps user in deciding production quantity. This report gives user details of physical inventory of lot, stock variance and adjustments made. With the help of this report user can know physical stock, current stock (at system) and their difference. User can know stock variance of a lot. This report serves as a ready price list of an item along with price specified at all price levels by user. This acts as a reference list of all item categories that have been set up by user. It shows category id, reorder level, GL account id, unit and conversion factor. This report gives with the knowledge of cost variance of item i.e. difference between master cost and weighted cost.